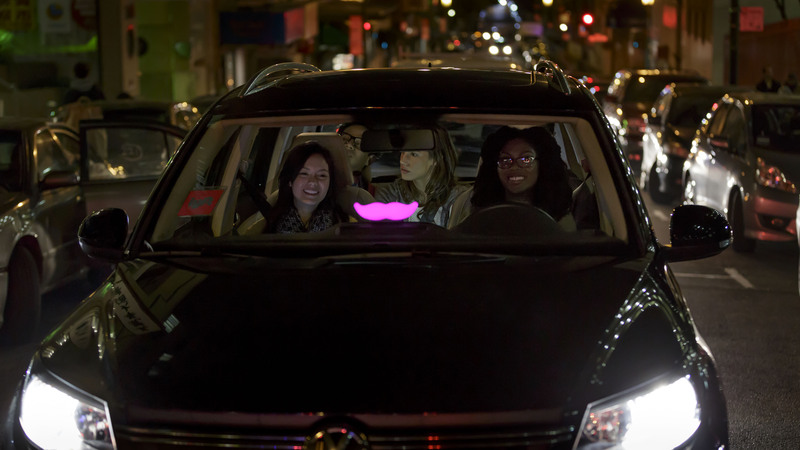 Lyft has announced an overhaul of the two-year-old taxi service, featuring a shimmering new glowstache shade, new partnerships and promising fresh updates to its smartphone app. The all-important magenta glowstache — with fade-resistant new dyes that better illuminate darkened vehicles — sets the pace for the upgraded service, promising a better transport experience. Easily attachable inside the windshield, the updated ‘stache lets drivers quickly transform into Lyft mode at will. In addition to the new look and a series of driver rallies across the country starting with San Francisco, Los Angeles, and New York, a slate of new partnerships seeks to make the service more attractive to drivers. A special deal on Intuit’s QuickBooks Self-Employed and TurboTax Online lets drivers do their taxes for free. Partnerships with eHealth and AutoNation provide drivers with more options and better deals for health insurance and the purchase of new or used cars. MasterCard, a longtime Lyft partner, will now offer Shell driver gas cards that are redeemable nationwide. Thsee changes, and others on the horizon, reflect Lyft’s response to trends emerging over the past year, including the service’s expansion into 45 new markets and more than 30 percent of rides taking place in well-established markets like San Francisco and Los Angeles, with Philadelphia just coming on board.